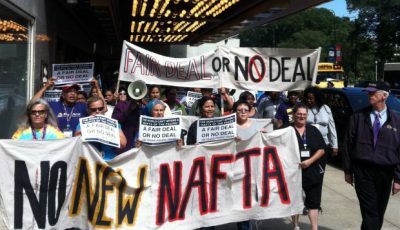 The never-ending so-called “NAFTA renegotiations” probably make everyone’s eyes glaze over, and for a good reason. Our political elites, whether in parliament, in business, or, most significantly, in the media, are adept at misleading and confusing Canadians about what is actually going on in this endless exercise of US bullying and Canada caving in. David and I are offering some much needed de-mystification. Note that David’s recent articles alerting Canadians to the true nature of the so-called free trade agreements, FTA and NAFTA, and the possibilities for Canada in US president Donald Trump cancelling NAFTA outright, are on our website, www.davidorchard.com. We welcome your comments and questions, and will make an effort to respond to all. Canadians are being inundated, virtually around the clock, by calls from political and corporate quarters, faithfully reported and embellished by the media, to “save NAFTA.” If NAFTA is “killed,” we are told, Canadians will lose thousands of jobs, our standard of living will drop and our trade with the US and our access to that market will be damaged. To prevent these catastrophic results Canadians, they say, must be prepared to make major concessions, including, if necessary, sacrificing the livelihood of our dairy farmers and their well-managed industry. Talk about not seeing the forest for the trees, in this case the tree being NAFTA! What those pleading for NAFTA seem to have forgotten, or simply don’t know, is that Canada already has another free trade agreement with the US, which will continue to rule us even if NAFTA is gone. From these give-aways to the US it is clear why US president Donald Trump has not said a bad word about the FTA and has not once threatened to get out of it! They also make it clear why Liberal leader John Turner, who fought the FTA hardest in the 1988 federal election, called the FTA “the Sale of Canada Act,” and why another former Liberal leader and prime minister, Pierre Trudeau, called it “a monstrous swindle.” What a difference it would make if our current government had listened to these predecessors, instead of rushing to a full body embrace of all things NAFTA , no matter the cost. If NAFTA ceases to exist tomorrow, all those eager to see Canada integrated into the US economy should be well satisfied with the FTA! To make even more concessions to keep the NAFTA strait jacket would be comic if it wasn’t so dangerous and destructive to Canada’s economy and sovereignty. If NAFTA comes to an end our trade with the US would continue to flow exactly as it did for years before the FTA and NAFTA existed. And our country would be free of the NAFTA provision which allows US corporations to sue Canadian governments for laws and regulations they do not like. (NAFTA gone, Canada would need to confront the fact that the FTA with its sovereignty-destroying commitments needs to be abrogated.) But for some of our politicians and opinion leaders, the prospect of Canada standing on its own two feet economically and politically is too much to handle, almost unthinkable, and therefore the pleading and begging to retain NAFTA will continue. David Orchard was twice a contender for the leadership of the Progressive Conservative Party of Canada. He is the author of The Fight For Canada: Four Centuries of Resistance to American Expansionism. Marjaleena Repo was national organizer for Citizens Concerned About Free Trade from 1985 till 1998, campaign manager and senior advisor for David Orchard’s leadership campaigns, and the Saskatchewan vice-president for the Progressive Conservative Party of Canada until its take-over in 2003 by the Reform Alliance Party.